For the last few years, scientists have been warning us that genetically modified children are just over the horizon. Rumors have been flying around that laboratories are already using a revolutionary new gene-editing technique called CRISPR to try to change the genes of human embryos. Advanced gene-editing techniques like CRISPR hold great promise for treating or even curing genetic disease in existing patients that need it. But in genetic engineering, it is not just the what, but the when, that matters. Any genetic modifications done at the embryonic stage are considered germ-line modifications, meaning those genetic changes will be incorporated into reproductive cells and will be passed down from generation to generation. Prominent researchers have called for a voluntary moratorium on using CRISPR technology in human embryos, even for therapeutic purposes, because of the inherent risk to multiple generations. They rightly argue that gene editing in humans should only be attempted in therapeutic cases where any modifications cannot be passed on. Unfortunately, the rumors surrounding the use of CRISPR technology to genetically modify human embryos have proven to be true. Scientists in China have published results of their experiments into editing the genes of leftover in vitro fertilization embryos that were deemed nonviable because of genetic abnormalities. Led by genetics researcher Junjiu Huang, the Chinese attempts were, by all accounts, a failure. Out of 86 embryos that researchers tried to modify, only 71 survived. Of those that survived, 54 were tested to see if the genetic engineering worked. Only four embryos showed evidence of the intended modification, an editing of the gene responsible for a blood disorder. Huang’s team is not the only lab that is attempting to edit the genes of human embryos. There are reports that there are at least four others in China alone. In fact, this work could be going on anywhere there are no legal prohibitions on the germ-line modifications of embryos. This includes the United States. There is a real fear that what begins with the editing of our children’s DNA for therapeutic purposes while they are embryos will quickly become the creation of truly designer children, with genes specified by parental desires. The question becomes: How can we Catholics stop the advent of genetically modified kids designed with DNA specified by their parents? We must become pro-life 3.0. Scott Rae, a fellow at the Center for Bioethics and Human Dignity, has an ingenious classification system that brings the pro-life movement into the 21st century. It is a clever way to awaken us to the perils we are facing. Rae describes three progressions of pro-life issues. Pro-life 1.0 deals with “the taking of life.” This includes abortion, assisted suicide, embryonic stem-cell research and euthanasia. Pro-life 2.0 deals with “the making of life.” These issues include artificial insemination, in vitro fertilization (IVF), surrogacy, pre-implantation genetic diagnosis and egg and sperm donation. 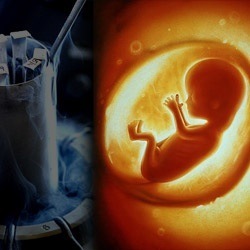 Finally, pro-life 3.0 deals with “the remaking of life.” This covers genetic engineering, human enhancements, nanotechnology, human cloning and transhumanism. We Catholics are very good at pro-life 1.0 issues, as we should be. Abortion, assisted suicide and embryonic stem-cell research are extremely important issues that threaten the sanctity of human life. Regarding the pro-life 2.0 issues, we must look closer at what goes on behind the scenes in artificial reproductive technologies (ART) like IVF. The mass creation, manipulation and destructive of human life involved in ART is often forgotten right after we see the beautiful face of an adorable, bouncing baby. We celebrate the new life created in the laboratory, as we should celebrate every life, but we fail to mourn, or even acknowledge, the loss that inevitably accompanies ART births. And this is just in the United Kingdom. We do not have a regulatory body like the HFEA in the United States, but the numbers are likely similar here and in many countries around the world. It is estimated that there have been 5 million births thanks to IVF. If 5 million children have been born, and if about 30 embryos are created for every live birth, it may mean that as many as 150 million lives have been created in the lab — and most of them have been lost, discarded or destroyed by research. Some of those 150 million human lives are still on ice, waiting for a chance to finish their lives. Many will die waiting. In truth, embryonic stem-cell research, human cloning and, now, the tinkering with the DNA of future generations would not be possible without the manufacturing of human life in the laboratory. Let us not forget that the 86 embryos used in Huang’s research were created by IVF. Many argue that these 86 lives were abnormal, so it was permissible to destroy them in research. The Church resoundingly rejects that argument — because every human life is valuable. And researchers will eventually have to begin experimenting on normal, viable embryos. Those will inevitably come from IVF clinics. So how do we become pro-life 3.0? First, we need to stop ignoring the pro-life 2.0 issues. It is the complete disregard for the sanctity of embryonic life inherent in IVF that has directly enabled scientists to play around with genetically modifying embryos. Attempts to alter the genetic makeup of human embryos will persist as long as we are callously mass-producing embryonic offspring in fertility clinics. These smallest of innocent lives will continue to be fodder for whatever science can think up next. As unpopular as opposition to IVF may be with our family and friends, we must stand firm and speak the truth about the dark underbelly of the fertility industry. Next, we need to vote for pro-life candidates even if they cannot effect change in abortion or assisted-suicide laws. Truly pro-life lawmakers can still greatly influence pro-life 3.0 issues that are no longer science fiction. We desperately need laws at the state and federal level in the United States that prohibit the germ-line modification of human embryos. Lastly, we need to pray fervently not just about pro-life 1.0 issues, but pro-life 2.0 and 3.0 issues as well. It is imperative we ask God to help us respect and protect all human life everywhere. That means life not just in the womb, but in the laboratory as well. We are standing at a pivotal point in human history. Will we Catholics ignore complex issues like human genetic engineering because they are difficult and scary? Will we turn our backs on the intentional genetic modification of our children, grandchildren and great-grandchildren? Or will we become pro-life 3.0? It is not an exaggeration to say that the future of our species may depend on how we answer that question. What is in an Egg Besides Trouble?